My good buddy considers himself a pretty big fan of Donkey Kong 64. Despite its penchant for making the player backtrack, its borderline insane amount of collectables and its veritable treasure trove of glitches, there’s something about that piece of vintage Rareware that keeps him coming back. My girlfriend’s the same way—she loves the Banjo games despite their regular dives into tedium. They aren’t alone, either, as classic Rare platformers are remembered fondly despite all the above shortcomings. The reason is simple—there’s enough goodness in the lot of Rare’s N64 platformers to make one mostly forget that they’re spending dozens of hours collecting a metric ton of shiny garbage for dubious reasons. In their prime, the developer had a flair for charming visuals, arresting soundscapes, and rock solid mechanics, not to mention clever writing. But with Rare’s IPs chained to bad Hololens tech demos and other such cruel fates, it seemed like the days of 3D collect-a-thons were a fading figment of gaming’s collective memory. That was, however, before Yooka-Laylee. 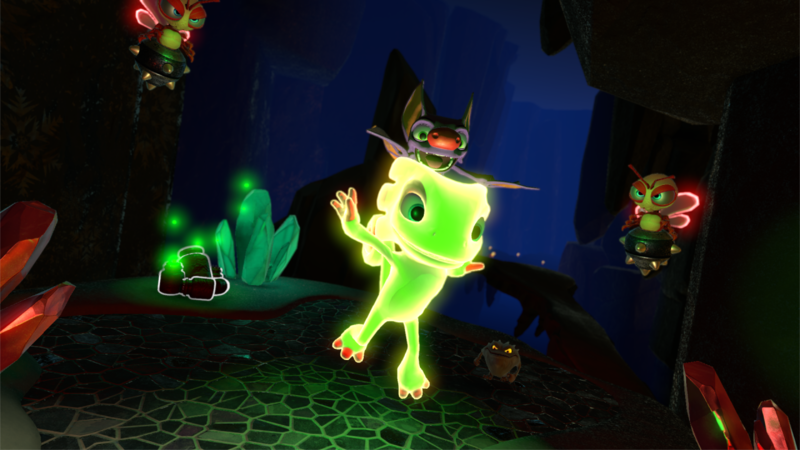 A Kickstarter success story if there ever was one, Yooka-Laylee is the first title from Playtonic Games, and hopefully far from their last. Put together with love and care by a 90s gaming dream team, this 3D platformer is a gleeful return to the days of Banjo (of the Kazooie and Tooie variety,) Donkey Kong 64, Conker’s Bad Fur Day, and other ambitious 3D platformers of yesteryear. Despite its gorgeous modern skin, this game’s heart is jagged and polygonal—steadfast in its commitment to recreating what people loved and hated about the sorts of title it aspires to sit alongside. 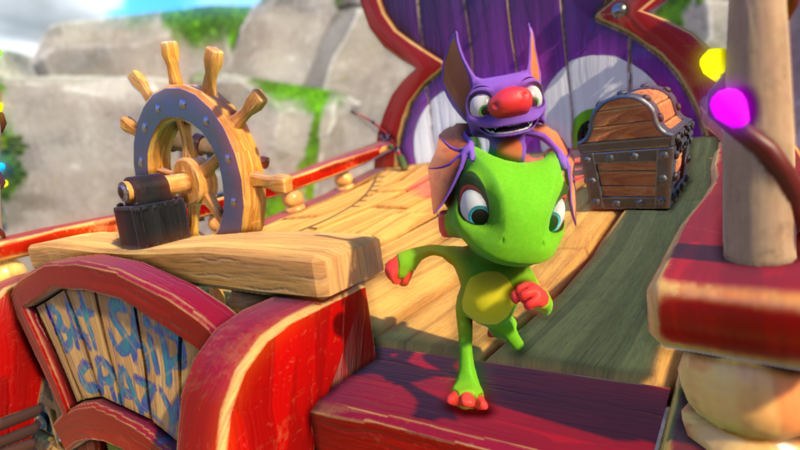 The charming and intentionally threadbare narrative stars Yooka, a plucky chameleon, and Laylee, a sarcastic bat. Both would be perfectly content to laze about on their wrecked ship and live off whatever treasure they happen to find. But when Capital B, a Trumpish bee in a three-piece suit, starts to steal all the world’s books, the unlikely duo is forced to storm his golden tower and stop him. Not out of any misguided sense of heroism, of course—Capital B just so happened to steal their latest treasure: a book of sentient golden pages known as Pagies. 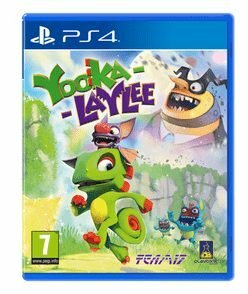 Players guide Yooka and Laylee through five worlds (six if the tower counts,) picking up pagies and saving the word’s worlds as they go. It’s not a particularly complicated yarn, but it’s not supposed to be. Like all the great Rare games, the plot exists solely to pack it to the brim with dumb jokes, clever puns, and a rogue’s gallery of eclectic characters. Yooka-Laylee nails this approach just as much, if not more than the N64 classics ever did. The humour here is pretty broad in its scope—full of enough cartoony zaniness for kids to be charmed by and laced with a whole bevy of double entendres that’ll make everyone but the most joyless adults chuckle. It manages to pull off the rare feat of being cuddly and dirty in one fell swoop, without ever veering too far in either direction. Now, imagine a Rare game with a good framerate, a camera that doesn’t actively work against the player, and sprawling worlds that are still easy to travel across in a short time. Oh, and platforming that allows players to exploit every piece of scenery. That imaginary game, practically impossible to make in the 64-bit era, is a now a reality. To call the combined effect of Yooka-Laylee’s core mechanics, level design, and progress “magnificent” would be selling it short. It’s astonishing to me that a company other than Nintendo has managed to craft a 3D platformer this mechanically sound and dynamic in 2017, and one with so much to uncover. Everything can be climbed on, jumped on, or otherwise messed with in some capacity. It’s a joy to just pick up a controller and mess around the five worlds with no real goal. Players enter these worlds through the hub of Hivory Towers. These worlds are quite large to begin with, but with enough pagies, one can “expand” them. Sometimes, an expansion adds a large degree of verticality to a world. Other times, it turns a tight series of corridors into a large sprawl. Whole other self-contained worlds can even be added to a map, in the case of Glitterglaze Glacier. With each expansion comes more pagies, quills (a currency used to buy special moves,) new enemies, etc. In the vanilla or expanded levels, however, the deal with collecting pagies is the same. Puzzles, boss battles, races, platforming challenges… they’re obtained across a wide variety of challenges that practically never run together. There are almost 150 in total, but only around two-thirds of them are required to confront the final boss. Yet with that statement comes a big caveat. Not everyone likes collect-a-thons. They kind of died off for a reason—because they were getting absurd in their requirements of players. To some, jumping around and picking up shiny trash stopped feeling novel and started feeling like artificial lengthening. For the type of person that breaks out into cold sweats at the thoughts of jiggies and gold bananas, Yooka-Laylee will be nothing short of a waking nightmare. Some people don’t have nostalgia for the period where Banjo reigned supreme, and I understand that. Another divisive element included from Rare’s heyday are minigames. There are a lot of them, and by proxy, a lot of pagies locked behind them. In fact, a whole casino-themed world is based almost entirely around them, to the point where getting that world’s pagies is kind of a minigame in and of itself. Minigames are another thing that aren’t as prevalent in modern gaming, and another thing that many players are pretty thrilled died off a while ago. But it wouldn’t be a Rare tribute without them, and as such, Yooka-Laylee is filled to brim with them. Now, personally, I think getting angry at Yooka-Laylee for being a collect-a-thon with minigames would be a little silly—like playing a roguelike and expecting to not die a whole bunch, or seeing a horror movie and getting miffed that the director tried to scare you. Playtonic has created a scale replica of 90’s 3D platformers, and that means including all of the junk that runs the risk of being monotonous. Still, I could see how some modern players might hate the painstaking efforts to bring back this style of game. Yet these sorts of people aren’t who Yooka-Laylee was ever for—it was for people who wore out their cartridges playing and replaying their favourite oldies. But what I doubt anyone will be divided on is that amount of TLC that went into Yooka-Laylee’s audio-visual package. There are games with bigger budgets and more “realism” on the market, yes, but few of them feel as joyfully alive as this. Every tiny frame of character animation, every choice of colour palette, every single inch of every single world feels deliberate—never phoned-in or repetitious. This is one gorgeous, charming game to witness, like a top-of-the-line cartoon come to life. It’s all backed by David Wise and Grant Kirkhope’s wonderful score, which represents both composers at the top of their game. From Glitterglaze Glacier’s mystifying soundscapes to Capital Cashino’s rollicking horns, and everything in between, Yooka-Laylee’s score highlights two masters of the craft bringing nothing but their best to the table. Hearing these two Rare icons team up makes one wonder why it didn’t happen sooner. One wonders, too, how Yooka-Laylee itself didn’t happen sooner. The demand was there, surely, as there is a sizable, vocal contingent still bitter about the basic demise of 3D platformers—a contingent I count myself a part of. Yet perhaps 2017 is the perfect time for Playtonic’s love letter to the gaming of yesterday. This is a period of time where games feel more homogenous and focus-tested than ever, where players seem more prone to anger than joy, where even some critics seem mired in bog of pessimistic snark. 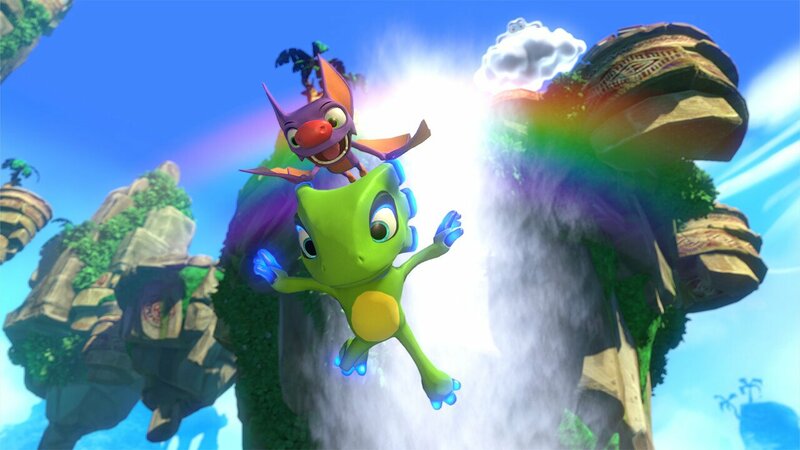 For me, Yooka-Laylee is the antithesis of gaming in 2017—a joyful, well-crafted game that knows what it is and doesn’t try to be anything else. Playtonic managed to pull off something that not only sits along the greats of yesterday, but can proudly hang with today’s best. 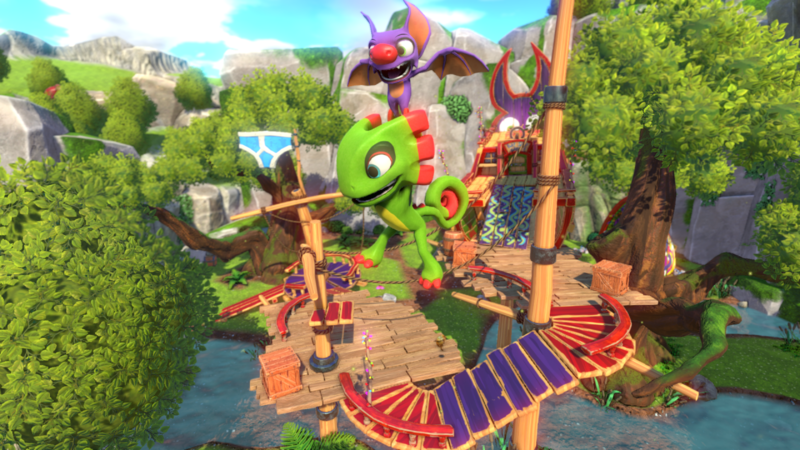 Yooka-Laylee is both a joyful ode to Rare’s heyday and a polished platformer that stands head and shoulders above what few contemporaries exist in the genre.